Terri Hendrix is a pioneering Texas songwriter who spins sorrow into joy and wrings wisdom from the blues, with a poetic grace and engaging melodic flair that has endeared her to three generations of loyal fans around the globe. Her shows at the Stateside Theatre – where she’s backed by her amazing band and the mighty Lloyd Maines – always sell out, so be sure to grab tickets early. Lyle Lovett has said, “If we could all sing like we wanted to, we’d all sing like Delbert.” The multi-Grammy Award-winning artist is at the top of his game with his latest studio album, 2017’s Prick of the Litter, which captures the balance of soulful energy and restraint that the legendary performer has been delivering in his live performances for decades. Plus, don’t miss the Austin Honors Delbert Weekend events, including a Marquee Star dedication in front of the Paramount. See event page for more details. When legendary folk music icon Arlo Guthrie took to the road to celebrate the 50th Anniversary of his seminal song “Alice’s Restaurant Massacree,” he was incredibly moved by the feedback from fans. "Alice’s Restaurant" — Back By Popular Demand Tour will coincide with the 50th Anniversary of the feature film Alice’s Restaurant, originally released in 1969. Don’t miss Arlo perform one of America’s greatest musical treasures in Austin, only at the Paramount Theatre. From breaking the Watergate story that led to President Nixon’s resignation to Bob Woodward’s revealing new book about Donald Trump and his presidency, few journalists have impacted American history like Pulitzer Prize winners Bob Woodward and Carl Bernstein. Now they’ve joined together for a historic speaking event to point out parallels from our past and provide unparalleled insights for our future—pulling back the curtain on Washington as only Woodward and Bernstein can. Anita Hill made sexual harassment a national issue by testifying at the Supreme Court confirmation hearings for Clarence Thomas in 1991. Her bravery empowered thousands of women to bring their own sexual harassment lawsuits and helped revolutionize the treatment of women in the workplace. Be part of an unforgettable, impactful night when Ms. Hill speaks about lessons learned and progress won since her testimony, how institutions can step up to promote equality, and why it’s more important than ever to keep fighting. Grammy Award-winning David Ball is the sole surviving member of the Austin/Carolina country-jazz trio (and Lyle Lovett favorite) Uncle Walt’s Band and this is his project paying tribute to that unforgettable music: Uncle Walt’s Band Album Release. Guaranteed to be a night that brings back fond memories of the late, great Walter Hyatt, Ball will also play songs from his solo career, adapted to the acoustic trio style. Perennial Paramount favorite Pink Martini is a "little orchestra" that draws inspiration from the romantic Hollywood musicals of the 1940s and '50s while spanning genres to make an eclectic, modern sound. Their arrangements of Latin music, jazz, cabaret, and cinema scores have endeared them to both national and international audiences, selling out venues worldwide. 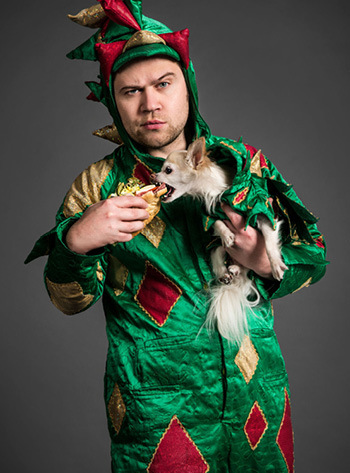 Piff the Magic Dragon combines jaw-dropping magic with incredible comedy. Think Larry David in a dragon suit: funny, grumpy and utterly baffling. He is joined by Mr Piffles, The World’s Only Magic Performing Chihuahua. “A stunningly good magician” according to Penn & Teller, Piff is one of the most original comedy acts you will ever see.